Blue Chip Juniper This shrub is an 'Idaho Preferred' plant. Blue Chip Juniper is a prostrate Juniper that has steel blue-green foliage throughout the year and takes on a purplish hue in the in winter. It will grow up to 8" to 12” tall and will spread to 10’ wide. 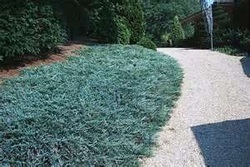 Blue Chip Juniper will do best in full sun to light shade. Use this low-growing evergreen conifer as ground cover, erosion control, or spilling over a wall. Blue Chip Juniper is drought tolerant once it is established. It is also deer resistant.